There are strong indications that the Department of State Service, (DSS) has completed a screening process for some of the ministerial nominees to make up the cabinet of President Muhammadu Buhari. 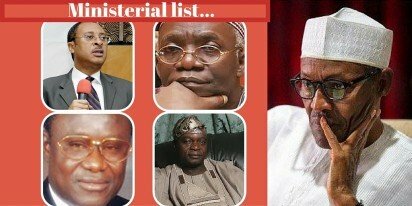 Among the list of those who were said to have been screened by the DSS are, former presidential candidate, Prof. Pat Utomi, Femi Falana (SAN), a former Governor of Osun State, Olagunsoye Oyinlola, a former finance commissioner in Lagos State, Mr. Wale Edun and Former Managing Director of Nigerian Breweries Limited, Mr. Festus Odimegwu. Others in the list are, Abubakar Malami (SAN), former Chief of Army, Lt.-Gen. Abdulrahman Dambazu (retd. ); an former chief executive of the Federal Inland Revenue, Mrs. Ifueko Omoigui-Okaru;. Vanguard gathered from a source very close to the presidency who pleaded anonymity that the aforementioned nominees had appeared before the DSS for their screening at the weekend. However, the nominees are yet to give any confirmation on the supposed screening which may not be far-fetched from the fact that appointments of this nature are treated cautiously in the official circle. It was gathered that no fewer than 20 nominees had been so far screened by the DSS operatives since the exercise started. Recall that the President had indicated in a chat with journalists in Accra, Ghana, on Monday that he would keep his promise of announcing names of his ministers this month. Our source revealed that the screening process by the DSS involved conducting background checks on the careers of the nominees and operatives were also checking for records of the nominees with anti-graft and security agencies.